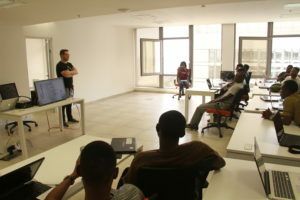 Codetrain recently hosted Tom McDonnell, a successful software entrepreneur from the UK. Tom is the CEO of Monterosa, a software company that helps its clients build direct and valuable audience relationships with stunning fan experiences and robust technology. They have engaged over 60 million fans in 195 countries and achieved 18 #1 Apps. Tom spoke about his story from being a developer to an entrepreneur to inspire Codetrain’s students. He also motivated to students to work hard to be globally competitive and be successful IT professionals.